Teresa and Sem have performed in more than 20 countries on 4 continents. They present a high-energy show full of surprises, all the while captivating young and old alike with their friendly stage presence. A combination of unicycling, juggling, acrobatics, comedy, balancing, music and magic, their zany antics have been featured at basketball half-time shows, theaters, fairs, festivals, corporate functions, private parties, trade shows, theme parks, libraries, schools, colleges and night clubs. 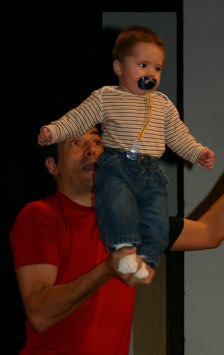 Nash joined the act in 2006, before his first birthday. Now a seasoned performer with his own web site, this witty young man is a natural addition to the show, and always a crowd favorite.